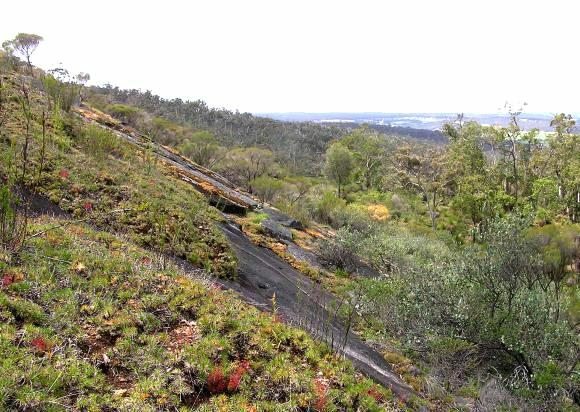 This popular walk area was once a key part of the proposed Gyngoorda Conservation Park but bauxite strip-mining will eventually expand through much of the area. 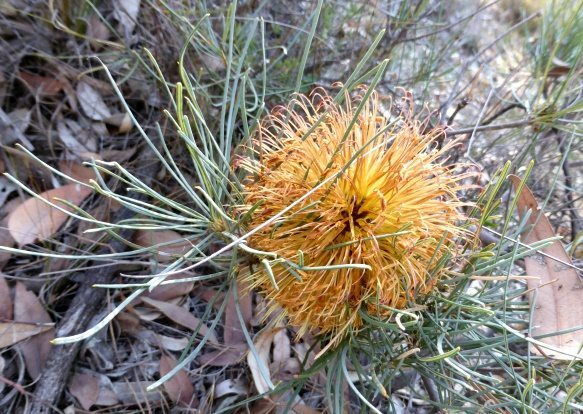 The vegetation here is more varied than in the jarrah-marri forests to the north and includes picturesque open wandoo woodlands on several of the slopes and in the gullies. Large granite outcrops flanking the Hill provide some excellent views. In the NE, the route also follows Galway Creek for a short section and crosses a number of other gullies and laterite breakaways. 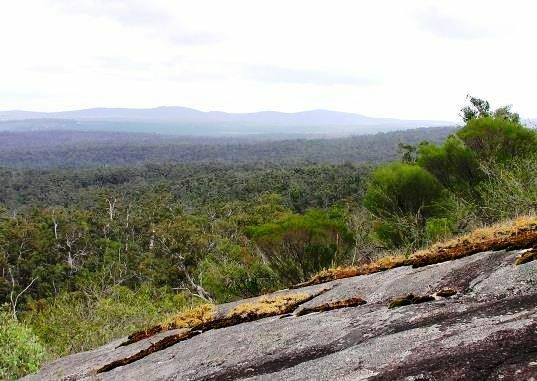 The SW and NE flanks of Bannister Hill provide some excellent views along this walk route, including to the Boonerring and Kimberling (White Horse) Hills 13-15km to the NW. On the SW flank of the Hill the route follows an extensive, sloping granite outcrop for about 600m, giving plenty of opportunity to enjoy the views. 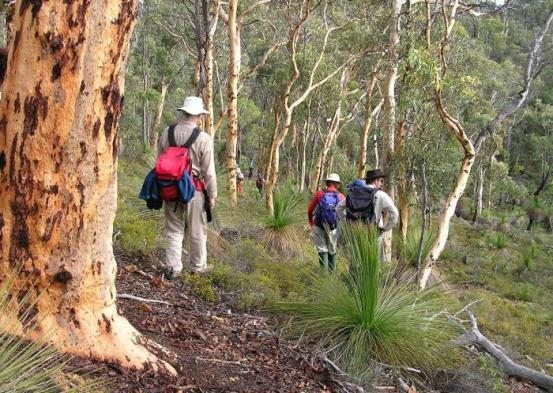 In the NE, the route also follows Galway Creek (may be flowing in winter-early spring) through wandoo woodland for a short section. The route also crosses a number of other (usually dry) stream gullies and laterite breakaways. 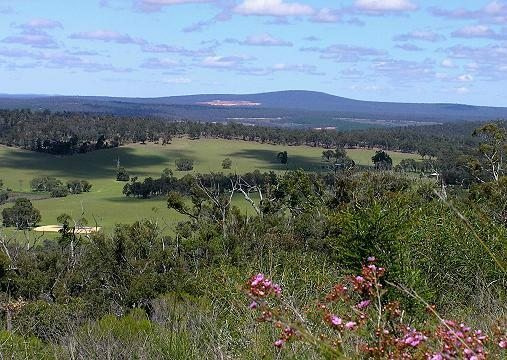 Bannister Hill (elevation 488m) is located within a relatively small area of State Forest (Gyngoorda Block) which is bounded by the Albany Hwy in the SW, the North Bannister-Wandering Rd in the north, and farmland in the east. 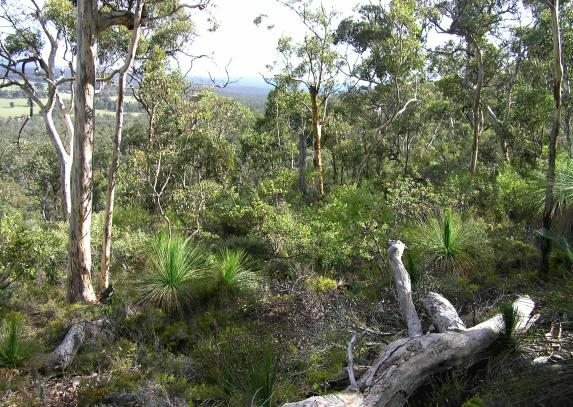 Despite the small area, the vegetation here is more varied than in the jarrah-marri forests to the north and includes picturesque open wandoo woodlands on several of the slopes and in the gullies, while mainly open jarrah-marri forest (with patches of parrot bush) dominates the higher areas. A survey station marker cairn of laterite boulders on the summit of Bannister Hill was erected in 1941 by the Royal Australian Survey Corps. Although the walk is only 12.5km in length, allow about 4½ hours including rest stops. The uphill walking involves only gentle to medium grade slopes. This walk area was once included as part of the proposed Gyngoorda Conservation Park. Unfortunately approved expansions of bauxite mining across much of the Darling Range will now instead eventually affect most of the Bannister Hill area and northward to near North Bannister-Wandering Rd. A planned new conveyor belt route will also traverse part of the Gyngoorda block within the Bannister Hill area. 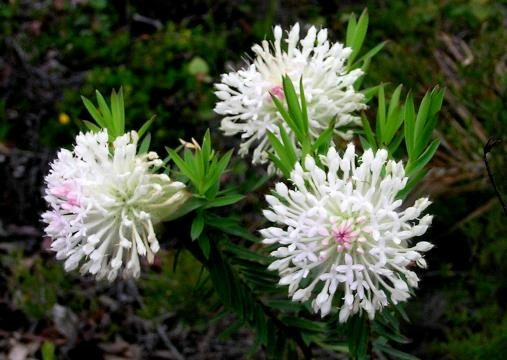 Also see WalkGPS video “Bannister Hill – once was a Conservation Park” . 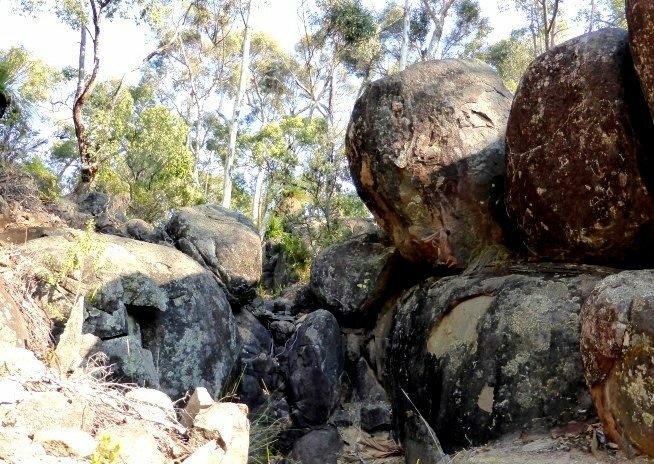 For overnighters: The Ginger Creek Campsite (which includes a 3-sided shelter) on the Bibbulmun Track is located about 7km NW of this walk area and could be included as an overnight stop on a very worthwhile 2-day walk starting and ending at the start point of this walk. From the start point (at waypoint ‘START’), follow the old vehicle track gently uphill, SE for 500m then veer left at ‘1’ onto an overgrown vehicle track at the Y-junction. Veer left again at ‘1-1’ to follow this old track ENE uphill through jarrah forest gaining a view to Boonerring Hill (12km to the WNW). Turn left (NE) at ‘2’ to follow the track along slope and then over a small ridge via ‘2-1’. The track begins descending quite steeply. At ‘3’ veer sharply right to leave the track and head southward off-track, initially along slope. 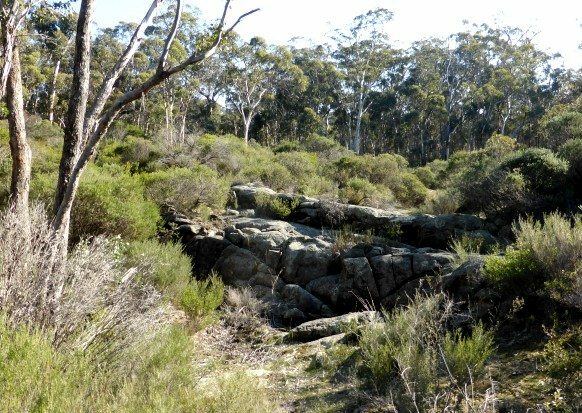 Soon reach a laterite breakaway and descend quite steeply to cross a gully (at ‘3-1’) which is lined along the stream course with Oak-leaved Dryandra shrubs. (Locate a kangaroo track for an easy route through the narrow belt of shrubs.) 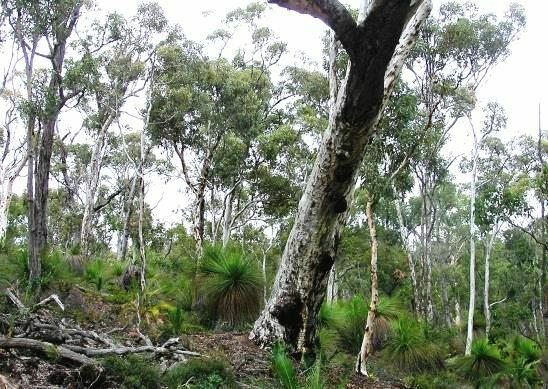 Climb the SE side of the gully to ‘4’, then veer right (SW) up the steepish slope through picturesque wandoo woodland. At ‘5’ veer sharp left (SE) to climb a ridge and reach a rocky laterite breakaway. After climbing the breakaway to ‘7’, veer sharp left (eastward) on the ridge top, gaining more good views through the trees to Boonerring and Kimberling (White Horse) Hills to the WNW. At ‘7-1’, veer SE across the laterite surface and through open jarrah forest to meet an old vehicle track at ‘8’. If you want to visit the nearby official (but unremarkable) summit point of Bannister Hill, follow the track approx. eastward for 200m along the broad, flat, laterite-capped hill-top to find the large survey station marker cairn of laterite boulders (at ‘9-CRN’) erected in 1941 (elevation 489m). The cairn is now surrounded by Parrot Bush. Then retrace your steps back along the track to ‘10’. Then veer WSW off-track and downhill, soon entering a narrow belt (about 50m wide) of shrubland which fringes the upper slopes of the granite outcrops along the SW flank of Bannister Hill. Veer sharp left (southward) at ‘11’across the slope; You should be able to pick a reasonably easy route through the shrubs and down the steepening slope to reach the upper edge of a granite outcrop at about ‘12’. Veer left (ESE) along the outcrop via ‘12-1’, passing through and around patches of open shrubland. Good views open up to the west and SW (and persist for much of the 600m length of the granite outcrop you will follow between ‘12’ and ’14’). Veer right (SE) at ‘12-2’ to descend along the upper edge of the outcrop to ‘13’. Then veer ESE along slope again via ‘13-1’ and pass through a narrow belt of denser fringing shrubland to re-enter the forest at about ‘14’. Continue SE along slope through open forest then descend to a smaller granite outcrop in a broad gully (at ‘15’). Then head NNE up the gully, initially on the outcrop, then following animal tracks uphill through shrubland for about 100m to reach open forest. Climb the laterite breakaway and follow the edge of the flat laterite surface to ‘15-1’ gaining a good view eastward to farmland. 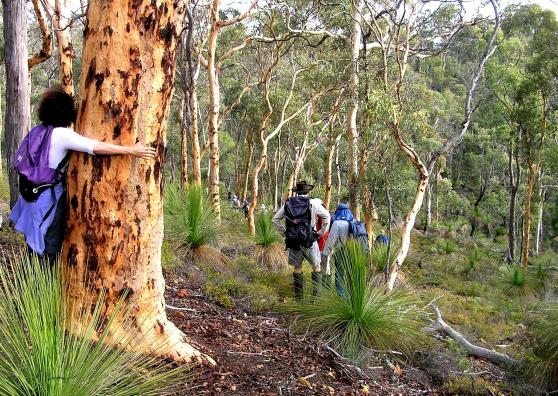 Veer northward at ’15-2′; descend to below the breakaway and walk along slope through mainly open jarrah forest. Then veer left (WNW) at ‘16’ to continue along slope to reach the upper slope of an outcrop (after ‘17’) on the NE flank of Bannister Hill, again gaining views WNW to Boonerring Hill and NE to farmland. Follow the outcrop NNW downslope via ‘17-1’, ‘17-2’ and ‘17-3’. Pass through a small patch of shrubland near the foot of the outcrop and veer sharp right (about NE) at ‘18’ and descend via ‘18-1’ across another small outcrop to cross a narrow gully and re-enter forest. Continue NE initially along the east flank of the gully.Veer right, upslope at ‘18-2’ to climb a laterite breakaway through wandoo woodland to a low ridge at ‘18-3’. Descend the hillside, veering right (ENE) at ‘19’. Continue ENE along a small spur ridge via ‘19-1’ and descend to cross a vehicle track at ‘19-2’ and reach a small outcrop on the west bank of Galway Creek at ‘20’. Then turn sharp left (NW) to r-cross the vehicle track at ‘20-1’. Cross Galway Creek at ‘20-2’ and head northward upslope. Turn left (westward) at ‘21’ to follow the north side of Galway Creek valley upstream. 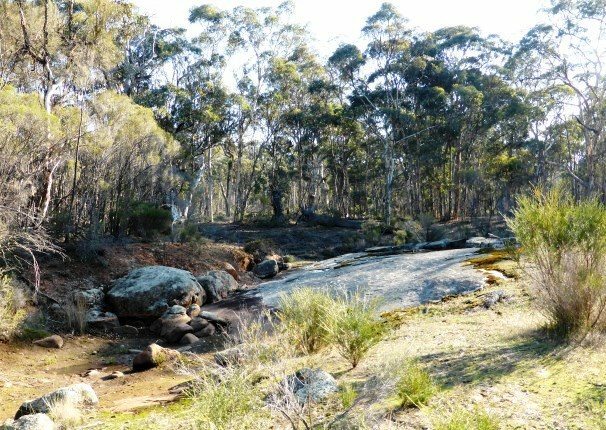 Pass through wandoo woodland via ‘21-1’ and continue westward to reach a possible small waterfall (after winter rain) and small rock pools along the stream course at ‘22’. Continue along the north bank of the gully to ‘23’, then veer west to cross the Creek at about ‘24’. Then head SW through the forest. Veer right at ‘24-1’ and continue WSW up the gentle slope via ‘24-2’. Turn right (NW) onto an old vehicle track at ‘25’ and follow the track westward from ‘26’. Continue westward gently upslope at ‘26-1’ and cross another vehicle track at ‘27’. Climb more steeply WSW to reach the crest of a small laterite-capped, hill top at ‘28’. Head westward through the forest to ‘28-1’ to then descend from the hill top via ‘28-2’ along a narrow, rocky ridge . Veer left (SW) at ’29’ to soon cross a gully at ‘29-1’. Finally, veer right at ‘30’ to head WSW to return to the start point, with possible short deviations needed along the way to bypass denser patches of shrubland. Gringer Creek Campsite: on Bibbulmun Track. This campsite, which includes a 3-sided shelter, is about 7km NW of this walk area and could be included as an overnight stop on a 2-day walk starting and ending at the start point of this walk. In west, head SW for 1-1.5km to Albany Highway. In east, head east to meet a N-S vehicle track which approx. follows the boundary between the State Forest and adjacent farmland, then follow the track southward for 1-2.5km to meet another track at a T-junction, then follow track right (SW) for just under 2km to meet Albany Hwy about 3.5km south of the start point. 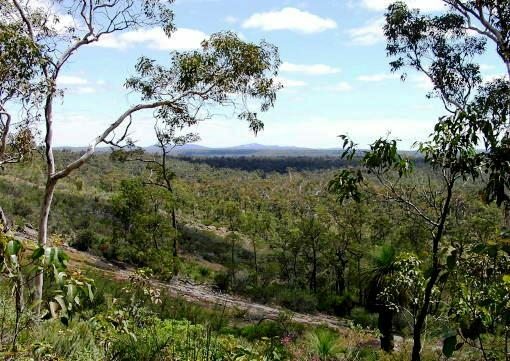 “Bannister Hill – once was a Conservation Park” – WalkGPS video. – Indicating the future impact bauxite mining will have on the Bannister Hill area. “Forests on Foot (40 walks in W.A. )”, Meney & Brown, 1985, pp.96-99 (Wescolour Press, Fremantle). Includes a simpler 14.5km walk which visits Bannister Hill summit and the northern area, but not the extensive southern outcrops. 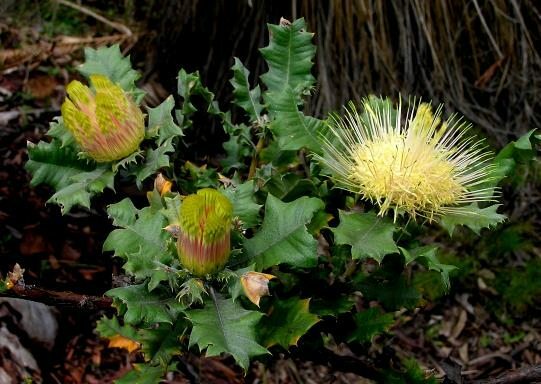 Includes some brief descriptions of the wide range of vegetation types in the area. Can be viewed at State Library of WA (book Call Ref. # 919.412 MEN). “South West WA 25K Scale Topo Maps”, Greg Harewood & Landgate, 2015. – Digital raster; ECW format on 16GB USB. See tiles #293-2132-I-NE, #295-2132-I-SE, #449-2232-IV-NW, and #451-2232-IV-SW for relevant map coverage. Crossing rock outcrops: A short, steepish descent through scratchy shrubland is required to reach the outcrop on the SW flank of the Hill and special care and commonsense is needed when descending the outcrop itself (especially between waypoints ‘12’ and ‘14’). The same applies to all outcrops. Don’t rush; avoid the steeper and smoother areas of rock, especially when they are wet and slippery after rain. 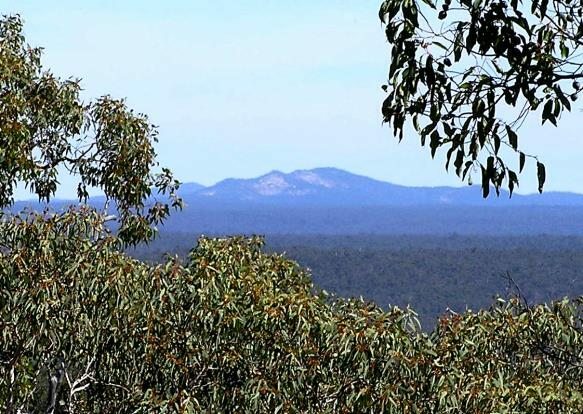 Future impact of bauxite mining: The Bannister Hill area is the firm target for future bauxite strip mining which is destined to prevent bushwalker access and destroy the intrinsic recreational and landscape values of this area. 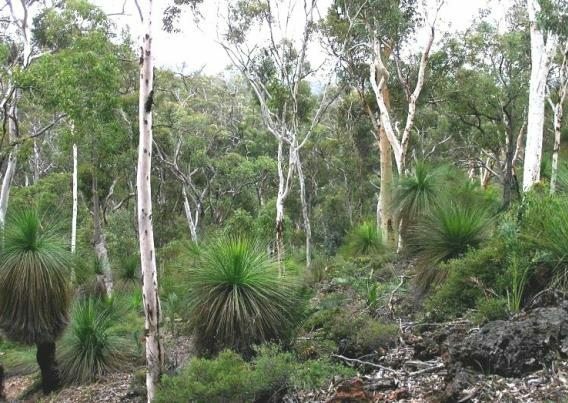 Ironically the relatively rich botanic diversity within the Gyngoorda forestry block was recognised in the “Northern Forest Region – Regional Management Plan 1987-1997” (CALM, Dec.1987) with its designation as a proposed future Conservation Park of around 3465ha to be managed identically to a national park. However, little more than a decade later, the “Regional Forest Agreement for the SW Forest Region of W.A.” (Cwth. & W.A. State Governments; 1999) withdrew the “Proposed Conservation Park” status. 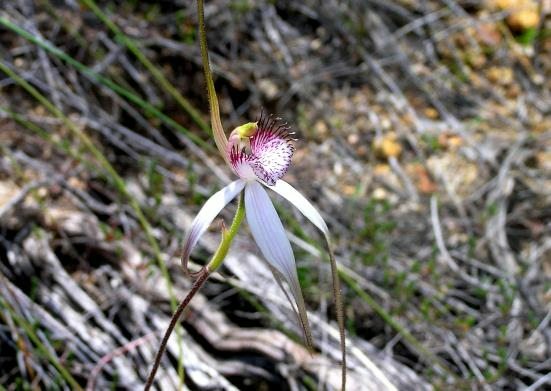 Under the later Forest Management Plans only a residual 1350ha eastern strip remains proposed (“reinstated”) as a future Gyngoorda Conservation Park while the other 61% (2005ha) has remained as State Forest ensuring it remains accessible to bauxite miner Worsley Alumina (now 86% owned by South32; previously by BHP Billiton). Worsley in 2008 gained environmental approval for future mining in the area as part of a major 30-year expansion of bauxite mining within their extensive existing lease. The mining area expansion within the extensive existing lease will eventually affect much of the Bannister Hill area and northward to near North Bannister-Wandering Rd. A planned new conveyor belt route will also traverse part of the Gyngoorda block within the Bannister Hill area. 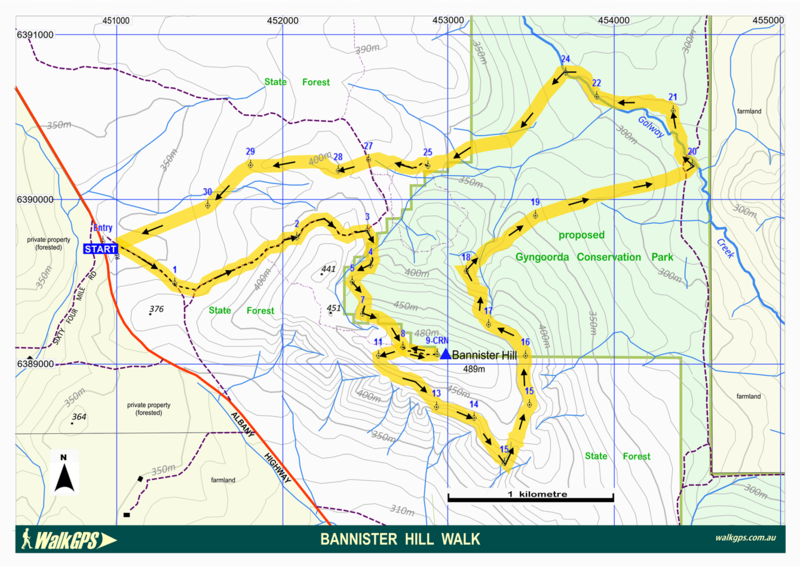 “Bannister Hill – once was a Conservation Park” – WalkGPS video. 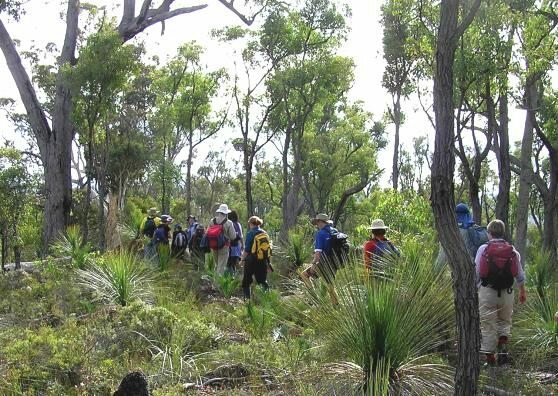 Walkers in wandoo woodland NW of Bannister Hill summit area. 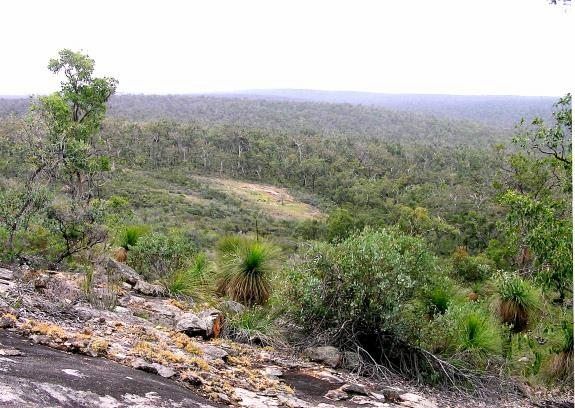 Wandoo woodland near laterite breakaway, WNW of Bannister Hill summit area. 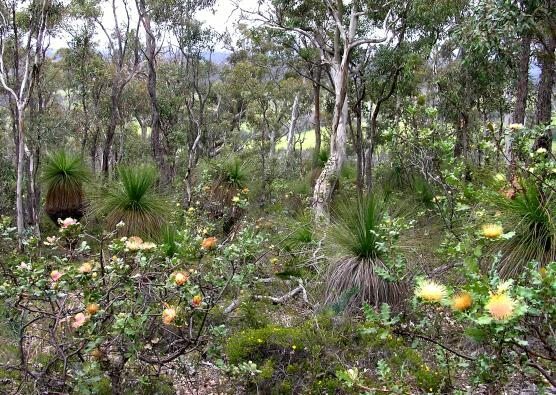 Wandoo woodland on slopes NW of Bannister Hill summit area. 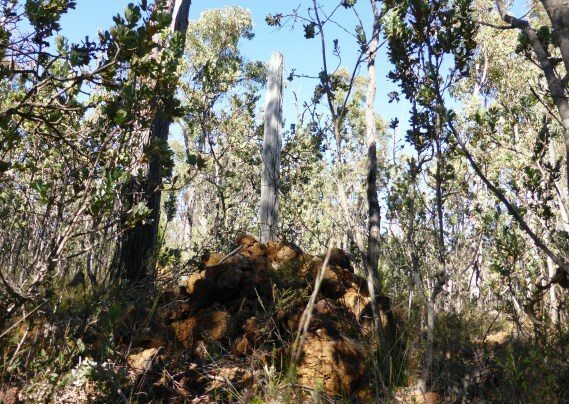 Bannister Hill summit cairn in Parrot Bush shrubland. 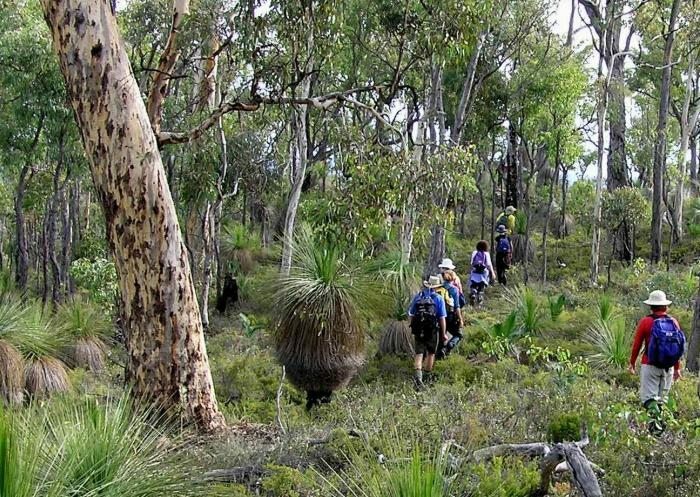 Walkers in mixed open forest (mainly jarrah) west of summit cairn. Walkers in mixed open forest west of summit cairn. View to Mount Cooke (29km NW). 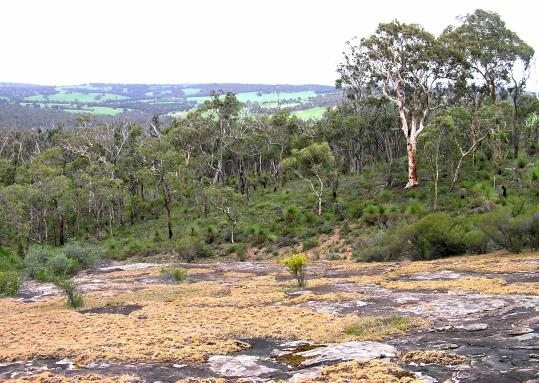 Bushland scene (with flowering Oak-leaved Dryandra) above SW flank of Bannister Hill. View from SW flank of Bannister Hill across farmland to mining operations (12km SW). View from SW flank of Bannister Hill toward Boonerring and Kimberling Hills (13-15km WNW). View SE along outcrop on SW flank of Bannister Hill. Bushland above outcrop on SW flank. View NE to farmland from outcrop on NE flank of Bannister Hill. View across NE flank of Bannister Hill toward Boonerring Hill. View across outcrop on NE flank of Bannister Hill. Boulders flanking stream course below NE outcrop. Small rock ledge across Galway Creek. Small outcrop along Galway Creek.